Whether you’re an executive, a traveling sales rep, a student, or a soccer parent, a slate full of smart apps can help you manage the ever-changing demands of your daily life. It doesn’t really matter whether you use an iPad or one of the new Android tablets; both platforms offer a wealth of options for staying on top of things. And in any case, it’s not about having the most apps--it’s about having the right apps for you. Head-honcho CEO types typically have human assistants who help them navigate the demands on their time and attention. The rest of us (including the human assistants of head-honcho CEO types) have to make do with technology. Fortunately, a properly loaded tablet can be a great stand-in for a personal assistant. Here are 11 awesome productivity apps for your iPad or Android tablet. At the heart of any good productivity system is a great to-do list. To-do trackers range from the simple to the supreme. Choosing the right app for you can be a deeply personal process that forces you to get to know your own mental habits better than you ever have, but I can give you a couple of good starting points to help you select a suitable app for tracking all of your commitments. If you're just looking for a minimalist app that lets you make lists of things that need doing, my first recommendation is Remember The Milk, whose newly revamped iPad app is a thing of beauty. On tablet screens, the RTM Android app is less compelling than the new iPad app, but its home-screen widget looks excellent on a 10-inch tablet, giving you a terrific at-a-glance view of upcoming items. Remember The Milk is spruced up for the iPad. Hard-core productivity geeks who want a comprehensive next-action tracker for the Getting Things Done method have plenty of options on the iPad, some of which can set you back $40. But my personal favorite is BitAlpha's Taska for iPad, which costs only $5, offers most of the same capabilities as the high-priced apps in a slick DayRunner-style interface, and syncs with the Web service Toodledo so you can access your data online from any PC. Android tablet users have few good options in the way of full-featured GTD apps. Although a few have emerged for phones, only a couple of them offer tablet-optimized interfaces, and I've yet to encounter one I'd suggest in a list such as this. The first company to bring a really comprehensive, tablet-optimized to-do and productivity tracker to Android tablets should find a ready sales opportunity. 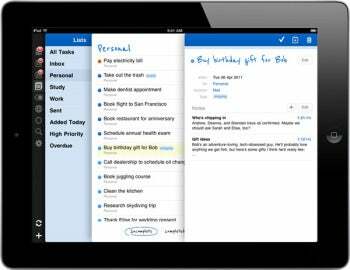 Even though Apple Mail for iPad can work with Gmail, many Gmail users are bound to find its interface a little too classic and static, especially compared with the Gmail Web interface for iPad. A terrific alternative for Gmail users who want to manage multiple accounts (say, a personal account and a business account) is Ginbox. This simple app handily solves the problem of managing multiple Gmail or Google Apps logins through a single interface, sacrificing none of the straightforward usability that Gmail fans love. Jorte is great for tracking tasks. The default calendars in both Android Honeycomb and the iPad's iOS have a certain style to them, but both lack some important features that third-party calendars provide. While Apple's iPad Calendar can sync pretty nicely with Exchange, it leaves a lot to be desired for Google Calendar users. A far better option for Gcal productivity is Readdle Calendars. This $7 app presents multiple calendars beautifully, and includes features for tracking tasks, as well. 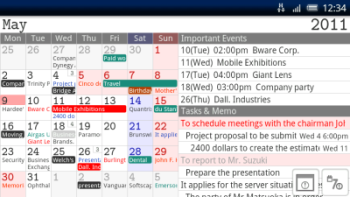 It syncs quickly to Google Calendar, and it lets you drag and drop events smoothly to reschedule on the fly. On Honeycomb, a free app called Jorte offers the most compelling set of calendar and task-tracking features I've found in the Android Market, and it syncs with Google Calendar and Google Tasks. Jorte isn't really GTD-optimized, but it is highly adaptable. Despite the fact that Jorte received a poor review from a previous PCWorld reviewer, I strongly suggest it to anyone in the market for a full-featured calendar organizer. Talk to Dragon, and it types for you. Since Android Honeycomb includes Google's voice-recognition software right out of the box, it's easy to dictate text directly into your software--you don't have to mess with the tablet's on-screen keyboard if you don't want to. iOS has no such feature, but you can add it with a freebie called Dragon Dictation. Longtime followers of voice-recognition software will recognize Dragon as one of the pioneers of PC dictation software, and this app certainly lives up to the legacy. Unfortunately, iOS can't let you use Dragon pervasively throughout the operating system, so you'll have to dictate into Dragon first and then copy and paste the text into the app of your choice. If you want to give your iPad a great approximation of Android's Voice Search, Dragon has a program for that, too: Dragon Search lets you use your voice to search Google, the iTunes Store, Twitter, Wikipedia, and YouTube, all on separate tabs, and all at once. Minima lets you run more than one timer simultaneously. When you're having trouble buckling down and focusing on a task, setting a timer can be helpful. Doing so gives you a clear block of time to spend concentrating on the chore, and offers a bright light at the end of the tunnel. My favorite timer technique, known as Pomodoro, involves setting a timer for 25 minutes and then working feverishly on just one task until the clock runs out. The specific time setting is less significant than the act of setting the timer in the first place, however, so you can use any interval you like. My favorite iPad timer is Minima Timer+, a freebie that lets you quickly set any interval and runs multiple timers simultaneously. On Android, I love the free Ultimate Stopwatch & Timer, which includes a nifty stopwatch interface that's just plain fun. If you're interested in the Pomodoro Technique specifically, some attractive tablet options are available. On Android, I recommend Pomodroido, which makes good use of the tablet screen to include task lists and track multiple sessions. 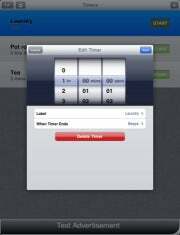 On the iPad, the $6 Pomodoro App for iPad offers the same functionality as Pomodroido, but with a more elegant interface.